The Race:The race was ehh. I ran a 5:13, which is 5:30 pace. I definitely felt like I pushed it. I got hard lock jaw and was getting really dizzy by lap 2. I lasted, but stalled pretty hard after lap 2. I think I'm too used to those 800s. I dont know how to feel. 5:30 is very average for a start to the season for me. I definitely don't like average but I also feel accepting of how I pushed myself. I think I need to find a balance between tenacity and self acceptance. I also did a 4x4 relay at the end. It was pain haha. We ran it about 6 minutes after the 1500. I felt like I was moving so fast and I only ran a 1:05 which made me laugh. It was a good time. Shoutout to the Christian Track Club at the U for putting it on haha. One Good Thing: I didn't think or panic while running. One Bad Thing: I stalled hard on lap 3, and when I did, there was no recovery. It felt like my legs were moving in slo-mo, and all that fight in me had died. It felt like I was moving through water. A Way to Improve: My mental game felt strong, but physically I was not where I want to be. I think I need more track workouts, and I think I need some plyometrics added to my routine. Sometimes you forget how much the little things count in the grand scheme of things. What a day! This was probably one of my top 3 most memorable runs while I've been here! I found a new route today! I ran down campus and into a neighborhood. From there, I ran back up through a neighborhood back to foothill! I decided to do 2 sets of pickups each made up of 1,2, and 3 minute intervalse with equal recovery! I pushed down to 5:15 pace for the first minute and first set! The rest of the set was around 5:30 pace! My second set was around 5:45 pace! It felt great to move so fast! I pushed up some hills during the run and still felt pretty good! The whole run felt pretty solid! I had 5 miles that were sub 7 pace, and my quickest mile was a 6:10! I'm happy to be doing a bit of speed stuff again! I'm hoping to get a track workout in either Wedensday or Thursday with Ethan! We'll see what happens! The legs definitely felt it today! Nonetheless, I kept pace just fine! I definitely need to do some yoga or something! Still trying to figure out what to do for a workout on Thursday! Welp, another day down! Today I got out of classes early so I was excited to go and get my run done, but then it got really cold and started raining which sucked! After about an hour of trying to drag myself outside, I finally settled on just running in the gym, which was fine but no where near as enjoyable! After the run, I went to ash wednesday mass with my roomates! It was really interesting, they have some cool traditions! Some guys from the christian track club reached out to me and Ethan afterwards and said we should come join them for some runs! I'm excited, we're finally getting somewhat of a communitty for runners here! It's much needed in order to actually help each other improve! Running isn't the same without a team! One Good Thing: I shared a solid laugh with Ethan today! Roommates feel like family sometimes! Also heard from Rayne and Maryanne! Sometimes college feels like it'll make you lose sight of the things that are the most important like enjoying sometime talking with friends or family! Today was a success in terms of putting people first! One Negative Thing: I did a slightly poor job at time budgeting when it came to my time after class! I could work on being better at my focus at time! Then again everyone needs some recovery time from the regular barrage of stresses that get thrown your way. To Work On: My willingness to go with the flow. I've decided that college has gotten better as I've improved my ability to take new chances and explore, even when it's inconveiniant. I need to be more willing to meet new people and go and do stuff with other groups, rather than be nervous about trying to do these things! I think this is something that I've done a lot better with lately, but I write it down so I don't so I don't forget about this one! YES!! What a good end to this week! Today was perfect! I rounded up a solid 4 guys from around campus and went hard on a track workout! It was me, Ethan, Dylan, and a newcomer Jason, who ran varsity at AF! What a day! We did 2 1200s at 5:25 pace with 2 and a half minutes of recovery inbetween reps and then we did 2 800s at 5:15 pace with a minute and a half of recovery! That killed! The second one especially had me beat! I died a little the last 75 meters, but then we did two 400s at 4:30-4:40 pace and killed it! My legs were on fire by the end and I was cramping up, but I never let myself just die off! Huge improvements in comparison to last week, and I'm grateful to be doing this thing with other people! Can't wait for some more races! This is what running has been missing! One Good Thing: On the last 2 400s, I could feel my legs giving out, but I kept my head up and pushed through and it got me through to the end! It was just a matter of shutting off my mind and hanging in there! One Bad Thing: I let myself go a little bit on the last 800! To Improve: Keep the affirmations going and stay on the lead's heels! This one has been on my mind for quite some time now! The lyrics are somewhat haunting and obscure, and the chorus is so powerful that I couldn't get this one out of my mind! So, I did some research! In this song Roger Waters is writing about Syd Barret's mental incapabilities! He uses the line "The lunatic is on the grass," and says that the line was based off of the keep off of the grass signs you see in public! He wonders why anyone would have that beautiful grass there if it's not going to be used in anyway! I think this points out some interesting ideas about how quick society is when it comes to labeling social oddities as broken! The lyrics advance the idea that anyone who goes outside of societies norms are wrongfully judged to be disfunctional! I think this claim is somewhat derived off of the assumption that there is nothing that inherintely grounds the norms of society to be correct other than what society says! I'm somewhat weary of this assumption that's built into water's claim, but nonetheless, I would like to think that Rodger's claim about society being quick to judge social anomolies holds up as fairly true! The other line that really sticks out to me is one of the most notable lines of the song, "I'll see you on the dark side of the moon." I get chills everytime I hear it! Here, Water's says he was talking about being able to relate to Syd Barrett's issues! Waters said he thinks that most people have a darker impulse within them that we spend our lives trying to control for the bettering of ourselves and the society around us! I definitely agree with this idea, especially when considering that I would say there really is no such thing as an ideal human being in terms of mental capabilities! Everyone has their obscure personality differences and deviations from the average person when it comes to their patterns of thinking! Mental Ilness is moreso just the extreme deviation from the average individual when it comes to patterns of thought! Someone related water's idea here to Freud's idea of the unconcious mind! I thought this was an interesting connection! Anyway, i just realized that I wrote more about a great song than the amount that I'd written for my great workout hahaha! I thought it'd be fun to be able to start seeing what I was listening to at any given time down the road as well as what my thoughts were about the song! Also, I'll often look back at certain runs and I usually correlate those runs with the music I was listening to at the time, so I like being able to see what my running was like as well as what my playlist was like haha! I'll probably keep the Song of the day thing up for a little while! We'll see! Today was good! I ran a solid 40 with Josh again! Unfortantely it was snowing hard, so we went and ran in the gym! I hate running the track in there just cause it's so repetitive, but we kept a good pace, about 7:10s! It felt good after the previous day's workout! The time went by a lot quicker with someone to run with as well! I want to keep up a routine where I can run with other people rather than just alone! Hopefully, I'll be able to do this between friends and the team! We'll see! One Good Thing: I spent a good chunk of time stretching after using the foam rollers in the gym! Also, it was good to geek out over math and CS with Josh during the run haha! One Bad Thing: This is sort of both a good and bad thing but I was an idiot and stayed up really late the night before to go to Guals with some friends! Of course, the lack of sleep was not good for me but I got a nice buritto out of it and a good time with friends, so it was worth! One Thing For Improvement: Spend some more time doing visualization and breathing excersises for the races! What I Listned to Today: Pancho & Lefty by Townes Van Zandt! It was Townes birthday last thursday and another album of songs that he never released was put up on apple music! I've been shuffling through that! Spring Break of last year on our trip to Moab was the first time I listened to Townes Van Zandt! So I figured it was a good time of year to listen to some of his music again! It'll be nice to get out of the cold for the break! It'll be good to do some camping as well, definitely excited. Went out with Josh and did Chuckawala at 6 in the morning! Apparently, college has not done us much good cause neither of us were bright enough to figure that the time change would mean the sun would be coming up later in the day hahaha! We ended up running the trail in the dark! It was so much fun but also kind of nuts! I forgot how prtty the mornings are here! Unfortanately, because of the dark, we missed a turn about 15 minutes in and ended up running out of trail! We ended up wandering for a good 15 miuntes trying to find the right trail which sucked cause it broke up the time in our run! After we found it, we picked up the speed again to about 7:30s and made it just past the overlook area and then flipped! It was a solid run! One Good Thing: I pushed up hills and maintained good form! One Bad Thing: The run got broken up into two segments! One Thing to Fix: Be more prepared when hitting the trails! Song for the Day: As she's walking away by Zac Brown Band. Its a good jam! Also hiked yellow knolls today for a good 5 miles! Im going to have to come back and run this one later! Great day! Went up through green springs! It felt so nice! I averaged 7s sharp! My form felt strong, and my legs feel like they've got some speed again! One Good Thing: I was speedy going over hills and I think my strides were feeling fairly balanced! One Thing to Work On: Getting more sleep! I was up late! The good news is I gave up watching Netflix and TV for a while so thats been helping the last little while! Well Spring Break was awesome! Definitely my best college experience thus far! We did valley of fire and arches! I put in a lot of miles hiking and after wednesday, I was feeling some pains that made me a bit nervous, and so I decided to not run Thursday and Firday, and just enjoy the hikes! We did Devil's Garden, Delicate Arch, and Windows in Moab, and then Rainbow Rock in Valley of Fire! I also did Yellow Knoll is Saint George! It was a good week! This morning Josh and I were back at it! We ran down campus and into the neighborhoods and then we ran back to the gym to get Stender! We finished off the run in the gym so we could have Stender nearby! Today definitely hurt bad! I was struggling for some reason, I think it's because my hips are so tight, but I stretched afterwards, which helped! Hopefully tomorrow Ill be feeling looser! I planning for a good workout Wednesday! Went a solid 40 with Josh this morning, he only went 20, so I ran two routes one out down foothill and one down campus! It was a beautiful morning the moon was huge over the capital and it was bright orange! It felt good to be running so early! I feel like I'm getting so much more donee! I think Ill keep this routine up! I ran with some ROTC guys down campus just cause they were doing a workout! That was kinda fun! Did 20 minutes of tempo today and kept 6:20 averages, I was hoping to maintain 6:13 but this was still fairly solid! I started a bit too quick around 6:00 and 5:50 pace and then about 14 minutes in I died hard and it brought my pace down! One and a half weeks till we race! Only one more speedworkout until then! On my cooldown, I was thinking about how I approach workouts and races mentally! I've always thought that enduring as much pain as possible during a race is a means to the end of PRing ,or decreasing one's time! Furthermore, because increasing one's pain leads to faster times, I've always thought that making pain your end pain, during a race, was a better method for PRing, rather than focusing solely on the PR. I was thinking more about this today and how this mehtod relates to pain, in light of Plato's 3 parts of the soul. Plato would likely consider a desire to avoid pain as an appetite, and so I figure that plato would consider pain to be processed by the appetite portion of the soul, the part of the individual that does not reason. Becasue of this appetite, there's always the incentive to slow down during a workout or race. The desire for comfort is a natural part of humanity, and so when an individual makes their end pain, a conflict arises between the rational portion of the soul and the appetite portion of the soul. The question during a race is always which part of the soul will win out, an individual's rational will, or their bodies appetite for comfort. The more I think about this conflict between will and appetite, the more I think about ways to strengthen one's will. I think I need to start testing different methods for strenghting my will, and strart being more mindful of the affects of these methods. Good Things: I'm thinking about new racing strategies and ended up within the ball park of where I wanted to be for this workout. Something to Fix: I let my form break and my pace slow down in the last 6 minutes of my workout. I think I need to be more mindful of my form and do some plyos. This morning I woke up around 6:30 layed in bed for about an hour while it rained outside, and then I got up and went running! It felt good to stretch my legs a bit after yesterday! There was a light rain today that was kinda sleet like! It felt great! I took a new route through the neighborhoods! Also, i finally got out track gear yesterday! It looks sweet! Im tempted to start implimenting two a days again since the days are getting longer and I feel like I have more time, but Im unsure as to if I should try it or not! Today was nuts! Ethan and I got out of bed at 6 and then ran 6:45 averages for a good 7.35 miles! The best part was we were talking the whole time without feeling strained! Hopefully, I'll feel just as good Friday! Something to Work On: Restrain myself a bit before racing today was probably a bit much before a race. Another 6 am run with Ethan we took it easy and went about 7:30 pace the whole time! Our route when down through the neighborhoods above East High and North of Highland! It felt nice! We talked a bit about an event he went to yesterday where he got to meet Ronald Reagan's economic advisor Arthur Laffer! It was an interesting conversation! Oh yeah, I also broke my Vo2 max record yesterday, so I'm kinda stoked about that! Anyway, hopefully tomorrow goes well between tests and races! Im pumped to just get out there and push myself! Today just might have been perfect. 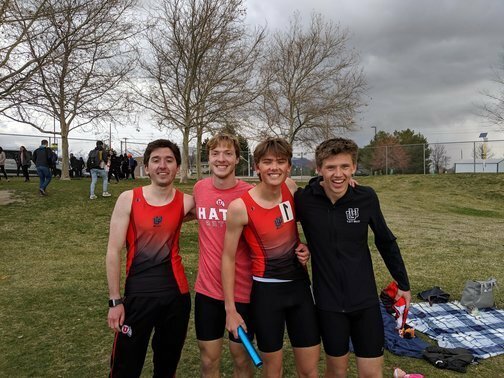 We ran at the UVU meet, and it was nerve racking af! Racing students who were legitimately recrutied by colleges to run for them was weird, but it brought a lot of fresh insight into my running approach! So, I PRd by a solid 30 seconds in a matter of 3 weeks! I was genuinely shocked! There was only one single moment where I let up my ground at all, which was great cause I sometimes have an issue with that! I felt the pain set in after 2 laps, and that was where I hit my first wall, and unfortantely, that was when I gave up some ground! I was right behind Ethan and Dylan the whole time! Also, it started hailing on the 3rd lap, so that made things interesting haha! My time dropped to a 4:45 1500! I think I'd attribute this success to two things: racing against people who are stupidly faster than me, because it dragged me out beyond my limits, and being metally rough! There was only one moment in which I gave into my desire for comfort during the race, and everyother time I had to choose between letting myself slow down and maintaining my pace, I choose to maintain pace! I definitely think my mental toughness has improved a bit! Now, I've got to mention the saddest/best part of this race! My goal was to at least beat one college runner, essentially don't take last, and to my surprise, I did it! I was not expecting to pull it off but I outran this dude Luke from Westminster, which felt kind of epic! Today was probably the best race that I'd had in over a year! So Stoked! One Negative Thing/Something to Fix: I let up on the very first mental barrier I hit. I think next time I need to focus on moving up when I feel that first wall hit.